Do It Yourself Special: FREE plans to add MIDI capability to the Korg Mini-Korg with the Synhouse MIDIJACK II The following plans describe a method of adding MIDI capability to the Korg Mini-Korg analog synthesizer with the Synhouse MIDIJACK II: Hertz so good! The Mini-Korg is especially well suited for this modification due to the tiny size of the MIDIJACK II circuit board and the fact that it is the first analog MIDI retrofit ever made that costs less than the instrument itself! Some drilling is required. 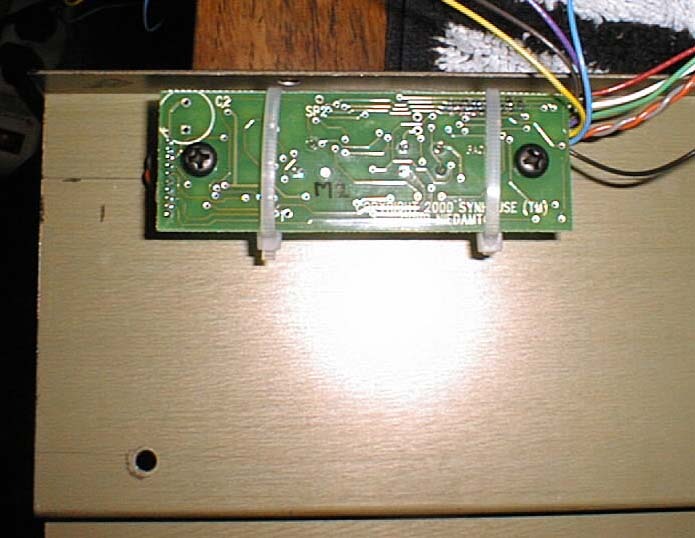 There is plenty of space on the Mini-Korg to mount the MIDIJACK with the provided hardware. You may be able to do this yourself if you have experience with electronic repair and the soldering of wires and circuit boards. If not, it is recommended that you send the instrument to Synhouse L.A. for a quick, low-cost Factory Installation. The particular installation on which this document is based was not done by Synhouse, but rather a very helpful Analog User, so neither Synhouse nor the Analog User who provided this is responsible for the accuracy of this infomation, nor any damage to your instrument or MIDIJACK II resulting from the use of it, misuse of it, or inability to use it. Those who choose to read it and use it do so at their own risk. Synhouse does not have any direct knowledge about this particular installation, but the author may be willing to answer questions if they are asked nicely. It is best to download these notes and photos and print them out on paper to look at while working on the instrument and make notes and check off the steps as you go. As with any project, you should completely read and understand each step of the instructions before starting. All repairs and modifications made to your instruments will be done at your own risk and Synhouse Multimedia Corporation assumes no liability for personal injury caused or damage to equipment or loss of use caused directly or indirectly by the use of these plans. If in doubt, don't do it! MIDIJACK II installation in Korg Mini-Korg 700 or 700s. Please note that I installed my MIDIJACK II with NO bypass wires. I did this simply because the Mini-Korg keyboards I have played have corrosion on the contact wires (in a difficult-to-clean place) which causes some wrong notes when playing grace notes or very lightly. I felt it best to play via MIDI only. Solder MIDIJACK #1 black wire to contact 40 GND. Do not disconnect existing black wire. Solder MIDIJACK #2 red wire to contact 37 +VCC. Do not disconnect existing red wire. Desolder the gray wire from contact point 38, solder MIDIJACK #6 green wire to pin 38. Tape and secure gray wire. The board has a silkscreened triangle under the resistor. Solder the MIDIJACK #4 white wire on the upper lead, the side on the top of the triangle. 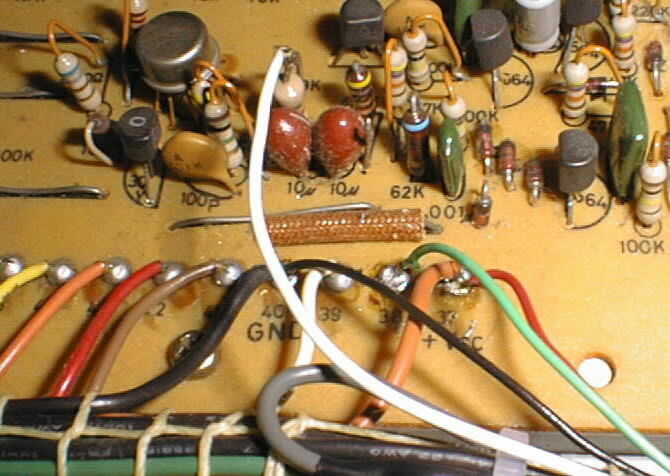 Locate the 4.7K resistor just to the right of the MIDIJACK #4 white wire (NOT the 47K which is nearby). It will have an upside-down triangle on the board. Cut the lead in half with wire cutters. Desolder the brown wire from the keyboard assembly, tape and secure it. I would recommend saving some room on the cover in case you want to add some other mods to the synth - this black cover is an ideal place to add hardware. Button up the rest of the installation but leave the cover off. Power up and check it. Once you have MIDI In, play in unison with another synth. Tune C4 using the external tuner slider. If you are out of range, use the internal 5K pot on the oscillator board (2nd from the right) to bring it in tune. 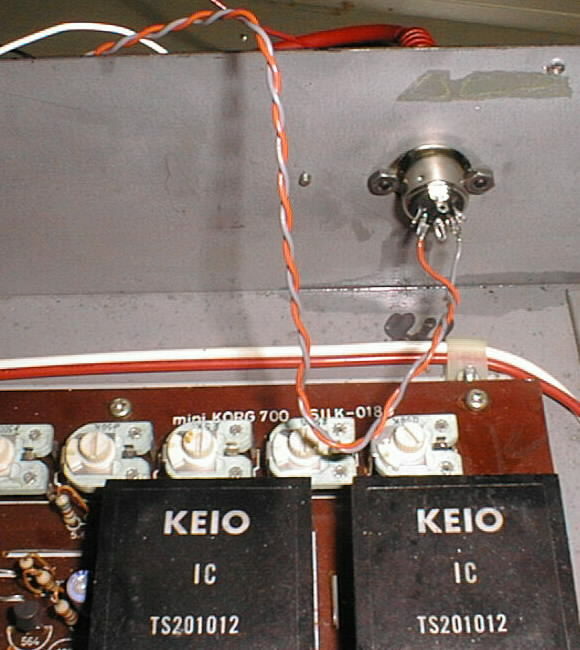 Now play C2, C1 and C5 - if they are not in tune, then locate the single pot on the voltage board (leftmost). Connect a VMM between the orange wires and chassis ground. Play C4 and check the voltage. It should be somewhere around 20V, but adjust between that pot and the 5K osc board pot to bring it in tune, linearly across the keyboard. I had to drop my 20.7 volts to 20.4 volts after the MIDIJACK II installation and keyboard removal.